Home Npower Official Updates Npower Enhanced Stage Announced: What is the Possibility? Npower Enhanced Stage Announced: What is the Possibility? Hope of 2016 beneficiaries had been rising since the federal government announced the Npower Enhanced Stage. I got this update like anyone else. News had it with confidence that the Buhari led administration will not lay off all the scheme’s volunteers who were set to head back home after 24 months in service. They promised the enhanced Npower, where it was believe that, the existing beneficiaries will be assigned more advanced assignments possibly different from their last ones of teaching, health caring or agro assisting work. None could say what form it would take as the support team themselves kept the cat in the bad till today. Where is Enhanced Stage for Npower by Now? Till today, the Promised Land is never reached. We’re just full of hope. Our hope was renew when the support team gave us a good news that stipend of N30,000 will not stop coming into our accounts. This promise was kept as beneficiaries keep getting alerts till this very hour. Does this mean the regular Npower just continues and no more enhanced Npower? Or for keeping the promise of continuity in the payment of the allowance, we should believe the enhanced stage Npower promise will soon be kept too? 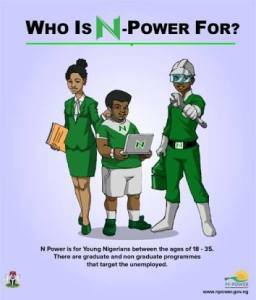 I was quick to tell you that it’s possible that there wouldn’t be another batch of Npower when the federal government announced the P-YES application. In fact, some people mistook P-YES to be scam because what we’re waiting for as at November when the presidential Youth Empowerment Scheme was announced was N-Build Application form for the 2018. In other words, no Npower intakes for 2018 even though a page were opened announcing “COMING SOON”. P-YES was announced instead. With these two occurrences, it’s not irrational to think that the promised Enhanced Npower may not happen any time sooner if ever happened. As a matter of fact, I advise all 2016 and existing beneficiaries to press reset button for the fantasy that the Federal government will soon announce this Promised Land. Just recently, they’re committed to a duplicated-kind of the same programme – P-YES. Successful applicants’ training tools and kits are now ready. Npower 2016 continues earning the regular 30k without further extension of duties. Won’t it be wise to stick to your regular Npower, pray and hope that it continues into the future whether there is power shift or not? Those on the lookout for another Npower may just take advantage of P-YES application if possible. The 2017 batch may be the last of its kinds.